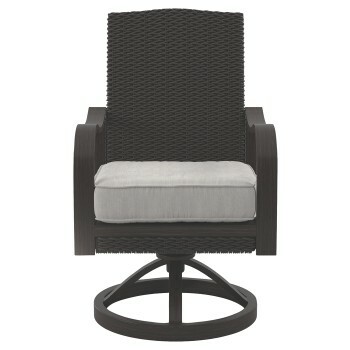 This outdoor swivel rocker dining chair is a casual contemporary addition to your backyard retreat. Extended back makes it beautiful from the front and behind. Resin wicker infuses impeccable tactility with the rust-proof aluminum frame. Durable seat cushion provides comfort and neutral style. Feel peace of mind with Nuvella® easy-to-clean and fade-resistant fabric. Full 360 degree swivel expands your perspective.